Last week we installed a cooler thermostat and lowered the fan temperatures and found out that was not the cause of the knock retard. Jack was left with a decision to make and it did not take him long to decide on his next move. During a phone conversation, Jack and I discussed both test that had been performed to date. Should a new set of pulleys be ordered? Stock or aftermarket pullies? The pulley would cause vibration's vibration's and would show up as knock retard. However, I kept hearing pinging, or what sounded like a metal cable rattling against a piece of tin. This begins to make me think I have no idea what engine ping is. We have a car that is basically stock and have heard engine ping with 97+ octane fuel in the gas tank. I am totally baffled at this point and won't make any more assumptions about the pinging sound I hear. This made the next test easy for Jack to decide on. Jack removed the Internet Racers Supply (IRS) Terminator mass-air-flow (MAF) housings and put the stock units back in. He put 50 miles on the car and then we meet up for another round of test. 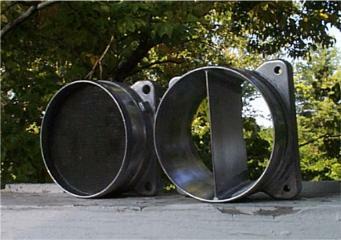 It is very important to understand a few things about the MAF housings on your car. 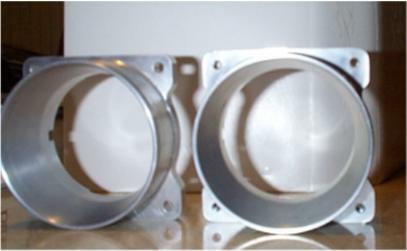 It is generally accepted that when you port your MAF housings you will lean out your air/fuel mixture. Auto Tap test have shown that this is not entirely the case. Auto Tap scans have shown that the PCM will richen the car's fuel mixture after several miles have been placed on the car after adding ported MAF housings. The fuel mixture will not be as rich as it was with the stock units in place. Let's take a closer look at how the MAF system works. When you port the MAF housing and remove the screen you are causing air to move by the sensors that is not be measured. More mass air is entering the car than what is measured. "Lower frequency outputs are being read by the lookup charts and the calculations are based on lower than actual loads and lower than actual airflow".1 This makes the PCM lean out the fuel mixture and add timing. This is where the oxygen sensors are needed. They read the lean fuel mixture and bump it back up to compensate for the MAF sensors low readings. 1 The fuel mixture in most cases will not be as rich as it was with the stock MAF ends, but it will be close. This has been noted using before and after Auto Tap scans with 100 miles being placed on the car in-between MAF housing swaps. Some cars get the engine ping with a ported MAF. What makes a car experience ping with a ported MAF housing? There doesn't seem to be a single characteristic that can tell us why, other than some get it and some don't because the engines all have different tolerances. Jack swapped out the MAF housings and placed to stock housings back on the car. Three runs were made and Auto Tap revealed the same thing as the previous two times. It isn't looking good for the home team. The knock retard kicked in at 4,000 rpms. The pulley looks like the culprit more and more every week.